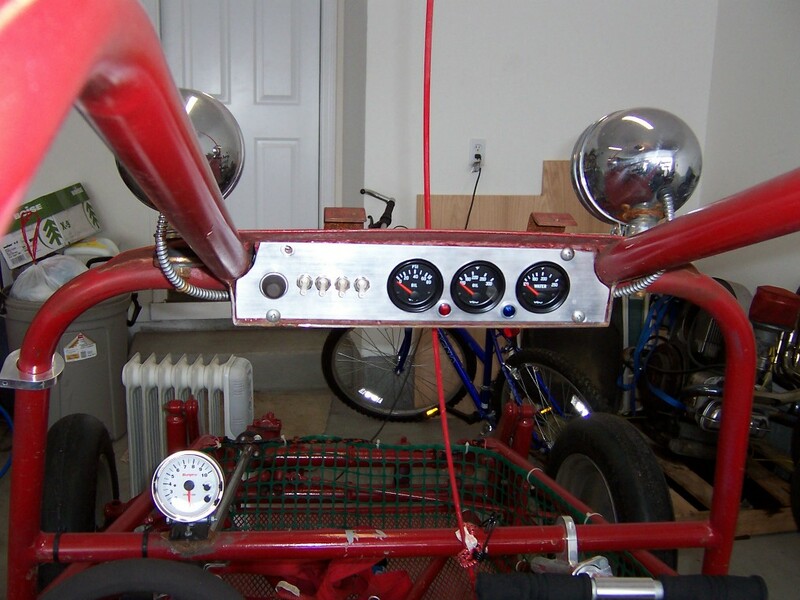 Every sandrail needs a cool instrument panel to display your gauges, hold the switches, etc. The more high-performance your engine is, the more important the gauges as you have to make sure nothing is overheating and destroying your high-priced engine. My sandrail had a rather constrained location for the instrument panel, and it was very difficult to fit the 2 1/16″ VDO gauges up there, but eventually it all fit. I installed 3 gauges: water temp, oil temp, and oil pressure. Also present are idiot lights for low oil pressure and generator/alternator failure. I used aircraft-style switchbreakers for the switches. These are nice because they are a combination switch and circuit breaker and eliminate the need for separate fuses for the circuits. The drawback is that they are not sand-sealed, so you’d better locate them in a location that won’t get hit by too much sand. The little rubber sand-switch boots that most places sell will thrad onto the switch-breakers, but I found that the boot had a tendency to pull the switchbreaker toward the center, which liked to make them trip. The way that I found to make the instrument panel was to first lay it out on a piece of still cardboard, install everything into the carboard, make sure it all fit, and then transfer the design to the aluminum. IMO it’s very difficult to get everything lined up in a straight line, and spaced equally, so pay attention to detail and lay it out with a ruler. Even at that, things still weren’t quite perfect. Also, I would suggest using a reasonably heavy piece of aluminum (like 3/16″ or 1/4″) because it is stiff and works out well. The original panel in my rail used very thing aluminum sheet that flexed and bent and had a lot of give when you pushed the buttons — not good. Here are the pictures of the oil pressure and oil temp senders on te mazda engine. I used an aluminum adapter (right below the filter) made by Racing Beat (available from Mazdatrix also) that fits a 1/8 NPT oil pressure sender and a 3/8 NPT oil temp sender. The senders I used are both VDO senders. 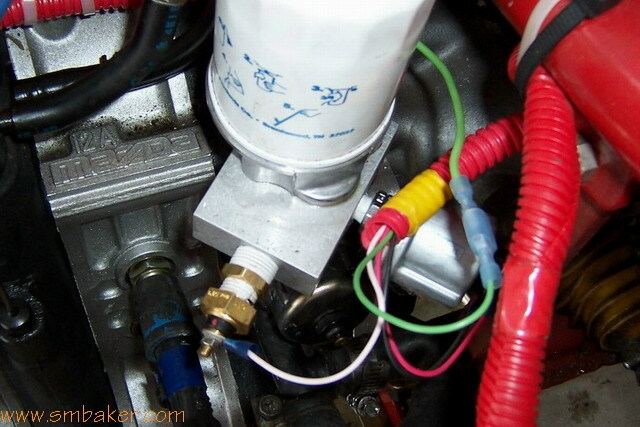 The VDO oil pressure sender is the type that supports both a gauge and an idiot light. When ordering senders, make sure you get the right thread — most VW places stock senders in metric, and the mazda adapter shown below uses NPT. The folks at Mazdatrix also advised me of some alternatives to using the adapter. You can 1) re-thread the existing oil-pressure sender hole (it is 1/8 BSP = Biritish Standard Pipe), making sure not to get any filings into the motor, 2) drill and tap the banjo bolt for the oil pressure line, if you have the water-cooled oil cooler, or 3) turn the existing mazda sender into a 1/8 BSP to 1/8 NPT adapter by cutting open the sender and drilling/tapping part of the sender to 1/8 NPT. I recommend using the adapter — it’s very easy to install and supports both oil pressure and temp.